Enrollment time will be coming up soon, and when I taught high school French, that was always a really stressful time for me. Not having enough students enrolled sometimes meant teaching a class I really didn’t want to teach so I’d have a full schedule. Sometimes it meant that my class became a dumping ground for the students who enrolled late and didn’t get into the other elective classes. Sometimes students who really wanted my class couldn’t take it because it conflicted with other classes they really needed. 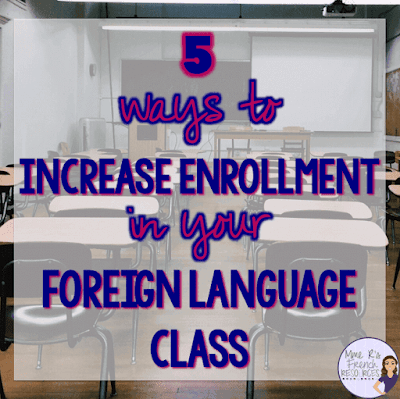 No matter what the cause, enrollment time can really stress out a language teacher. 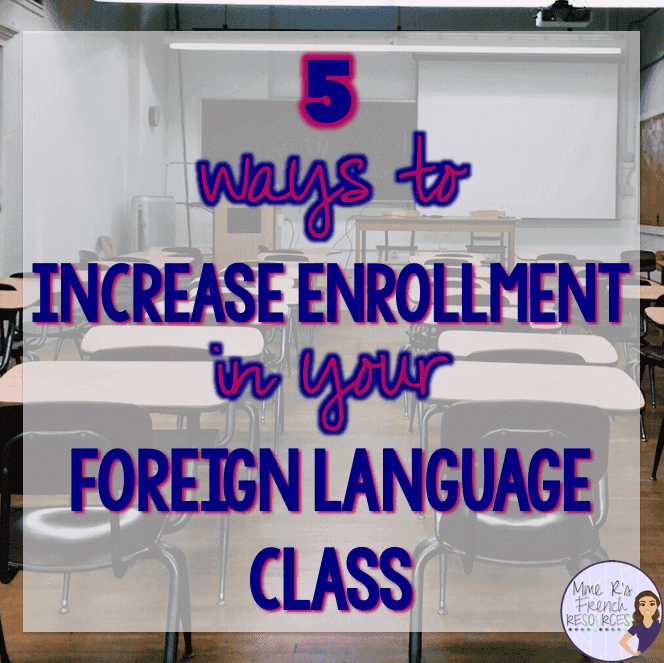 Here are some ways I increased enrollment in my French classes. 1. 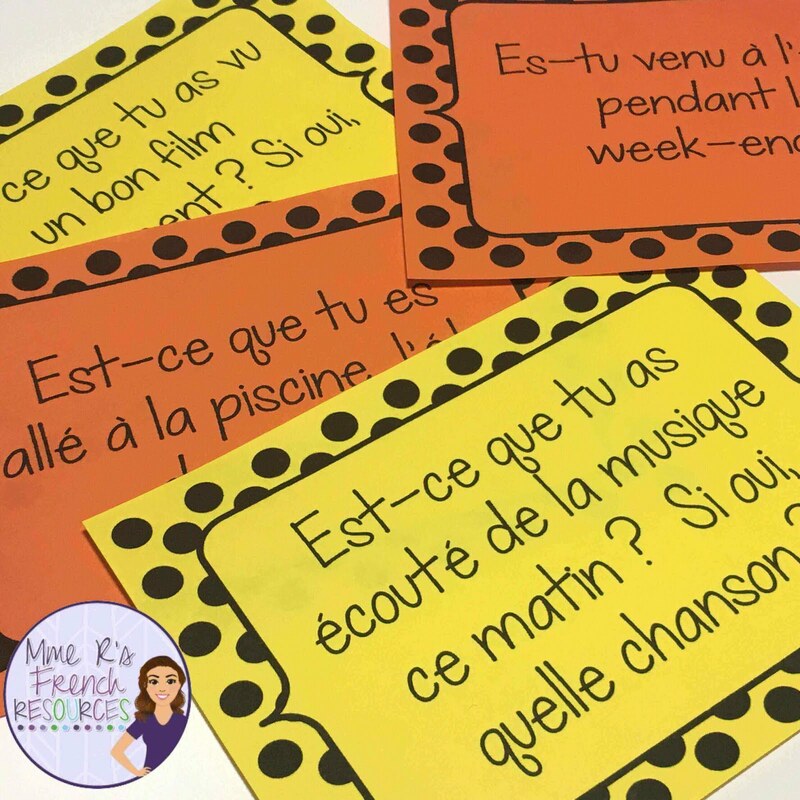 Offer information to students and families on the importance of French. Where I live, there are quite a lot of Spanish speakers, so naturally parents encourage their children to take Spanish. I get it. Hey, I took Spanish, too! A lot of parents and students don’t understand how important French is. After all, it’s an official language in Canada, and as Canada and the U.S. are important trading partners, that makes it a very important language in the U.S. as well. If you are in Canada, it’s likely that French is not as hard to sell as it is in the U.S., but you still want to make sure that students continue to take French for as many years as they can. Because families might not always see how French can be helpful, I would prepare information to send home to families of incoming high schoolers. Then, thanks to my principal who encouraged me to grow my program, I visited the middle school, talked to the incoming students, and sent that information home to their parents. From my first year to my second at that school, my enrollment doubled! I started that job with only 3 sections of French. By the time I left, I had a full schedule and they hired a second French teacher! 2. Entice them with decorative projects. One of my favorite parts of teaching French has always been the projects. While they have clear learning goals and can be very effective teaching tools, they are fun to do! Students want to have fun, and since kids are walking past your room everyday, why not give them a view of what they could do if they were in your class? 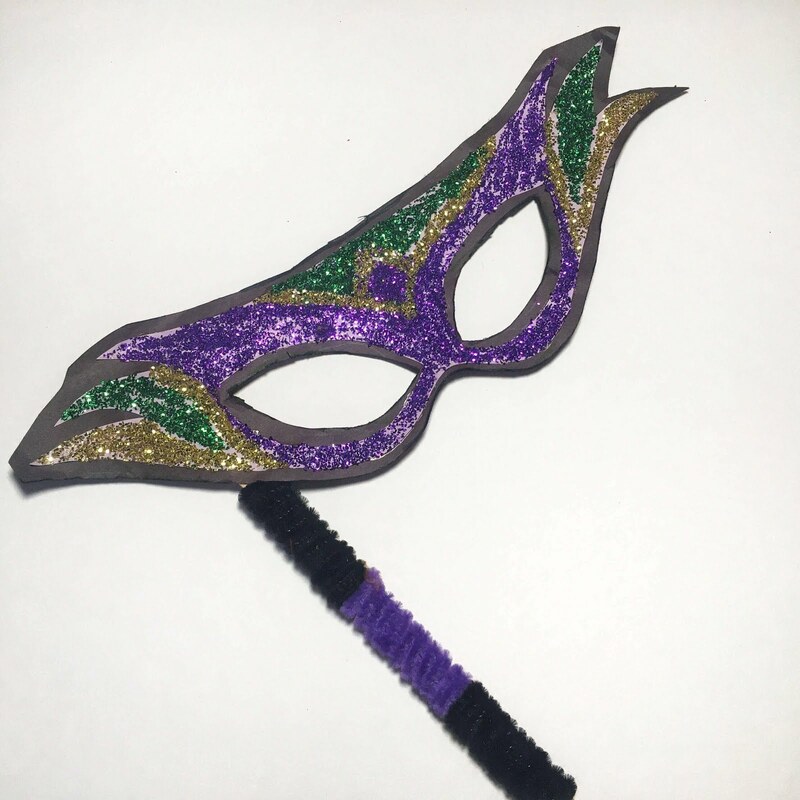 You can display formal assessment projects or make artwork such as Mardi Gras masks or Eiffel Tower models. Find 5 beginner French vocabulary and grammar projects here. 3. Work with your Spanish teacher colleagues. I frequently hear from teacher friends that the students choose Spanish because it’s easier, more fun, or the Spanish teacher doesn’t give homework. Luckily, I always had amazing Spanish-teacher colleagues and we worked in collaboration rather than competing with one another. If you can work together to try to align your course expectations and homework expectations, that’s great! Sometimes that isn’t a realistic expectation, so all you can do is make your class the best that you can. Remember, even if more students enroll in Spanish, it does not mean that you aren’t an amazing teacher! 4. Take your time to teach the basics. I don’t know if French is harder than Spanish, because I learned Spanish as a French speaker, so it was already really easy for me! However, I do hear this from people everywhere. It is true that French spelling takes a while to master, and all those silent letters don’t make it easy on our students. Don’t feel rushed to get through a curriculum, teach all your units, or follow an unrealistic pacing guide in your textbook. Take time to teach classroom phrases, practice a lot of basic speaking, and help your students acquire listening proficiency before jumping into verb conjugations. If they can’t speak or understand basic phrases, they just are not ready to start filling out a ton of verb charts. Not only will they not excel, they will be bored. For a lot of us, enrollment isn’t just getting the students that first year. We need them to come back for French 2, 3, 4 and beyond. They won’t do it if all they do is conjugate verbs. 5. Have fun in class, and speak a lot of French! It is okay to relax and have fun. French is great, because part of your job is to teach them to talk, so spend a lot of time talking. I remember once when a French 2 student came to me at the end of the hour to tell me how much fun class was that day since we didn’t do anything. Typical student comment, right? I just smiled, because actually, we had done a lot, she just didn’t see it. I had told them a story about something that had happened to me over the weekend. By that point, I didn’t speak any English in class, so that five minute story turned into a ten minute story with their questions. After that, I sat on my stool and just asked them random questions about their weekends. That probably took another ten minutes. When they were done, they did the around the world activity from my passé composé speaking cards. By the time we finished all of this, they only had ten minutes left of class, so we did a quick-write where I had them write as much about their weekends as they could in five minutes. We shared a few and it was time to go. See, students love to learn, they just don’t always want to it to feel like learning. The more we can do to make the learning feel natural, the better. Learning a language happens first orally. Perfecting the language can involve worksheets, verb charts, and textbooks. If we strive to make the learning more natural, it will be more fun. If it’s more fun, more students will want to take our classes. An added bonus? Teaching is just a much better job when you’re having fun with what you’re doing, right?